What a book! I was hesitant to pick this up because there has been SO much hype surrounding its release. Everyone who got an arc was raving about it. I mean, it does have a 4.38/5 stars on Goodreads as of now. Usually when there’s a lot of hype surrounding a book, I try to hold off reading it. For some reason all the excitement makes it harder for me to actually pick the book up. Your expectations have much further to fall when a book is so beloved. You want to love it to. I only just read The Wrath and the Dawn (a favorite of many), and I loved it! So I’m sure all these successful and widely popular books that I’m not reading would end up being favorites of mine (that’s what I’m hoping will happen when I finally read Six of Crows). 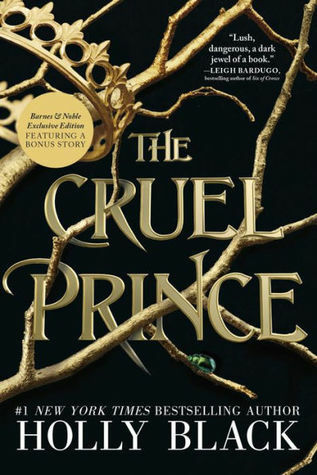 So, back to The Cruel Prince. I caved much earlier than I normally do and bought this. From the prologue I was intrigued. Since reading those first few pages I’ve hardly put it down. Between classes at school I never read, but today I was reading in all the spare time I had. One of the reasons why I love this story so much is because of Holly Black’s writing. She is truly a spectacular storyteller and writer. Years and years ago I read The Spiderwick Chronicles, which I think I really enjoyed. More recently I read the first book in The Magisterium Series, which Black coauthored with Cassandra Clare. I wasn’t super into The Iron Trial. I enjoyed it, but I have no desire to continue with the series. Since I didn’t absolutely love it, I wasn’t feeling any pressure to read any of Holly Black’s other books. I am so glad I finally did because now I know what I’ve been missing out on! Black’s world building is spectacular. She makes Faerie seem real. I cannot wait to read more of her books. They have all moved up to high spots on my tbr list. Holly Black is also wonderful at writing characters. They are so deep and complex, I honestly don’t know what to think about any of them. Jude is so wonderful unexpected and unlike the average heroine of a book. She’s violent and angry and wants power. How many heroes of a story want power? Most heroes want to save the world, or fight evil, or find love. Not many would admit to wanting power. I actually have a hard time calling Jude the hero of this story. It would be easy to say Madoc, or Dain, or Balekin was the villain, but even they aren’t black and white. All of Holly Black’s characters are so complex. Also, Jude killed someone and wasn’t even phased by it?! I feel like a need a whole book just to explain the inner workings of her mind to me. Now let’s talk about Cardan. At the beginning of the story I thought he was a jerk and he really seemed like a minor character to me. But of course, he’s not as simple as he appears. By the end of the story I just wanted Cardan to be happy, and I was so mad when Jude tricked him! I hope everything works out for him. I also really liked Madoc as a character. He seemed very realistic to me, despite being a Faerie. I thought his relationship and dynamic with Jude and Taryn was super realistic and relatable. Now onto Taryn. I do not like. Not one bit. As someone who has a sister and other friends who are like sisters to me, I would never ever agree to step aside as my sister was being bullied or harassed just because some I guy I liked told me to. She’s selfish and weak and I honestly hope nothing works out for her. All in all this was an incredibly interesting book. I’m giving it five stars because I am so impressed by Holly Black’s writing! Now to wait until the next book comes out!